TL;DR: Invest in people, setup processes, continual improvement and think in flow. When I was in Bali, Mark from wooden-ships.com took me to see the company’s factory which was amazing. They had been running the business for over 10 years and now had nearly 300 employees. The idea of a business creating that many jobs to me is amazing. His wife and partner Paola told me that Mark was really into “Lean.” I knew about the Lean startup but didn’t realize it was derived from others in the manufacturing world. I right away started telling Mark about how all his operations should be online, less people and more technology. He laughed. I thought he was silly. Mark suggested I read the Toyota Way to understand things. - Cards. They have a pull system where orders are pulled for new material every 15 minutes or so. - All orders are custom made and minimal inventory is stocked up. - They removed places people could hide errors and had a board detailing hourly performance of the plant. I’m sure there are more but you’ll have to visit Mark to learn the rest. I wanted to highlight the major things I found interesting in the Toyota Way which is one of Mark’s bibles and a key to adopting a lean system within your company. - Continuously invest in people and promote a culture of continuous improvement. - “Muda” (waste) is a term for anything that takes time that does not add value to your customer. Map out this process to help eliminate. - Accumulate facts and learn by doing. - “Pull system” where things are only delivered when they are needed. Think about supermarkets replenishing rows when the stock goes down. Think just-in-time. - Traditional process is improve process time and replace people with equipment (Noah’s former style). - Things built in cells with close arrangement of people, machines or workstations in a processing sequence. One piece flow. Only build what is needed. - The entire system stops when defects are found. Then go to the 5 why’s to really get to the root cause of issues. In other method of batches it can take way too long to realize problems in the process. - Decisions are made through looking at many alternatives and including as many stakeholders as possible. - Noah’s thought: Maybe consider using sound as well as visual cues for how things are going in your business. At the Gambit office we heard some other company always ring a bell and go crazy every time something happened. Definitely seemed like a fun thing to do. - Need visuals for the business and technology supports what people do. This is mapping out flows and clearly displaying success metrics. They discussed how metrics don’t always show why things are happening. Bottom line: you can visually see almost instantly if something is off. - Everything is documented. Knowledge is shared and encouraged among employees. All the while trying to see how to improve the processes already in place. - Training a new employee can take up to 3 years. They are patient in their hiring / culture and training. - Try to keep all key documents / decisions boiled down to 1 page. - Plan, Do, Check, Act. Repeat! - Noah’s Suggestion: Setup aweekly group session to improve one thing. 52 increases at end of year. You can also have this be anytime so you may have > 365 improvements. If they are even 1% per improvement or less that compounds to some big #s.
While traveling Europe I have way more time to read, do you want me to keep posting these reviews? Any suggestions on books? These are great points. We've come from the startup world here at Well.ca and we've been looking into lean for quite some time. I believe we have a good sense of it and we keep trying to improve on it, but any insight is always embraced and we love ideas from any industry. We try to keep inventory as tight as possible to keep things lean and I'm always searching for areas where less human action can be required without sacrificing productivity. well.ca is really impressive. nice work. i generally think that's right but this model was interesting to read about. Whenever I get a comment from Roy (this is my first) I feel like a celebrity is taking to me and I blush. Some of it does sound a bit common, but some parts I think are great are taking defects so seriously and really baking the 5 why's process in. You've done a pretty good job of enumerating the basic principles behind "The Toyata Way". Members of APICS, The Association For Operations Management (http://www.apics.org/default.htm), promotes - amongst other philosophies - and many conventional businesses have been adopting, LEAN principles for some time now so it has been very interesting to observe Eric Ries (@ericries) et al promoting lean as a philosophy in regard to web start-ups albeit that what Eric means by using this term is not exactly what LEAN stands for in conventional production terms. However, in whatever fashion the term LEAN is applied, the principles make for much improvement in a businesses bottom line and are therefore well worth understanding and applying. Hey Noah - Digging your review, thanks for posting this! 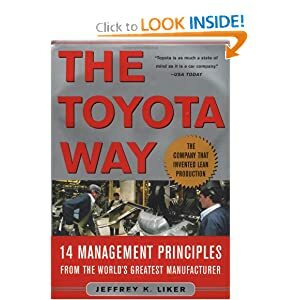 Would love to see another "classic" business book reviewed by you (not necessarily the latest/greatest hype-pop-science but something that has stood the test of time like this Toyota tomb). Touche. I was thinking more along the lines of how some of the countries we are visiting don't have the infrastructure in place for recycling. In general reduction is great. I am tempted lately to just take pictures of my sentimental things and throw them away or give them to someone else who'd actually use them. I don't think having more recycling cans is the way to go either. I guess, it makes people feel better when they waste and can throw it out to a recycle can, but doesn't actually solve the big problem. At the end of the day, recycling can is just the beginning of the whole recycling process, and the more we thrown into that, the more complex it gets in the later phases of the process. That's probably why, EU still has much higher recycling rates than US. They are amazing. Totally worth reading. It's very da vinci codesque in terms of speed. Also, very graphic and clever. On book #2 right now. Stieg Larsson is next on my daily commute audio book tour... it seems as though everyone says amazing things about all three books. I'm always amazed how east asia is full of wisdom when it comes to living and organizing. Reading more on the Taoist philosophy, Tao Te Ching, helped me understand better the way they think. According to Tao, the natural way is wu wei, doing things as necessary without waste. I also loved the 'The Art of War', which also is a great book written based on that philosophy. Thanks for the comment. I hear you on no waste. A bit surprising while in Europe not to see tons of recycling or trash cans readily available. That's more literal. I've been meaning to read Art of War and have bought / borrowed that book numerous times. Need to sit down and read through it. Although it has little to do with Lean and Agile philosophies, I have enjoyed reading Bob Sutton's "The Knowing-Doing Gap: How Smart Companies Turn Knowledge into Action" Its examples are 100% old school, but the philosophies are great. Also, Switch, while trendy, is a great book to refresh on balancing the reason of the mind and the irrational movements of us humans. Have you read either yet? I'd love to hear your thoughts if you have. I just got Switch and am finishing up some fiction books (Stieg Larsson ones). They really are that good. Then it's off to Switch and other business-y ones. Thanks for the summary. Have you read Delivering Happiness yet? I have read it. Pretty disappointing. Have you checked it out? Interesting to hear about all the struggles but didn't get much more than that. Great notes! I've been meaning to read this book too. A lot of these ideas are very similar to Agile programming methodologies that define a continuous process that eliminates waste. Some of this stuff is probably difficult to apply to startups. E.g., what's the average length of time an engineer is with a company in SV? 1-2 years?